Harendra's research interests are in the area of synthetic pharmaceutical chemistry, pharmaceutics as applied to nano-carriers, and advanced non-viral drug/gene delivery system design, synthesis and evaluation. His team at PACE have been instrumental in developing highly versatile micro- & nanobubble formulations, which when used in-conjuction with ultrasound, pave the way for improved rates of 'on-demand' drug delivery and release in target tissue. Harendra also has a keen interest in developing bioresponsive drug/gene delivery systems with current engagement with pharma partners, globally, to commercialise his platforms. 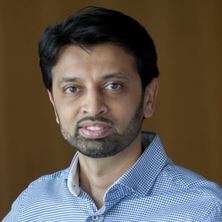 Separately, Dr Parekh has been developing a program to reformulate TCMs, in collaboration with researchers at a leading Chinese research institute; the outcomes of this work was aired across Asia in a BBC World News story, and showcased (TV & radio) by the Australian Academy of Science, National Touring Series. Harendra completed his BSc in pharmacy (UK) and registered as a Pharmacist in 1998. He went onto undertake his PhD in Medicinal Chemistry at the University of Nottingham in the same year. Under the supervision of Dr B. Kellam and Dr. S. R. Chhabra he investigated the development of novel linkers for solid phase peptide and glycopeptide synthesis. Harendra was awarded his PhD in 2002, and after a short time working in community pharmacy in the UK relocated to Australia and took up a position as research officer in the School of Chemistry at UQ. He continues to be a member of the Royal Pharmaceutical Society of GB and is also registered with the AHPRA (pharmacist) in QLD. During his post-doctoral tenure he explored the area of non-viral gene delivery via chemical synthesis of novel dendrimeric systems. Emphasis was on the treatment of age-related macular degeneration and in 2004 he received Uniquest's Trailblazer Prize for commercialisation potential. In May 2005 Dr Parekh was appointed Lecturer within the School of Pharmacy, and promoted to Senior Lecturer in 2011. He also holds adjunct positions at Manipal University (India), and the National University of Singapore's Nanoscience and Nanotechnology Institute (NNI). Dr Parekh is engaged directly with leading clinicians/physicians across the fields of ophthalomology, ENT, cancer and endocrinology. In addition Dr Parekh engages with pharma industry partners, globally, to translate his platforms from the bench-to-bedside, through a highly multi-disciplinary team approach. Dr Parekh's Nanobubble platform has received media attention, having been aired across Australia. Thakur, Sachin S., Parekh, Harendra S., Schwable, Carl H., Gan, Yong and Ouyang, Defang (2015). Solubilization of poorly-soluble drugs: cyclodextrin-based formulations. In Defang Ouyang and Sean C. Smith (Ed. ), Computational pharmaceutics: application of molecular modeling in drug delivery (pp. 31-51) Chichester, United Kingdom: John Wiley & Sons. Parekh, Harendra S., Liu, Gang and Wei, Ming Q. (2014). A new dawn for the use of traditional Chinese medicine in cancer therapy. In Subramayam Vemulpad and Joanne Jamie (Ed. ), Recent advances in plant-based, traditional, and natural medicines (pp. 131-150) Oakville, ON, Canada: Apple Academic Press. An evidence-based perspective of herbal remedies for cancer patients. Parekh, Harendra S. and Jing, Jing (2011). An evidence-based perspective of herbal remedies for cancer patients.. In William C.S. Cho (Ed. ), Evidence-based anticancer herbal medicine (pp. 399-422) New York, U.S.A.: Springer Verlag. Parekh, H. S (2011). An introduction to dendrimers-versatile drug/gene delivery vectors. In P.D. Gupta and N. Udupa (Ed. ), Nanotechnology in health care (pp. 355-367) Nataniyon Ka Rasta, Jaipur: S.P. Publications. Shah, Neha, Ouyang, Defang, Mutalik, Srinivas and Parekh, Harendra (2011). Dendrimers as carriers for the effective delivery of drugs and genes. In P.D. Gupta and N. Udupa (Ed. ), Nanotechnology in health care (pp. 367-391) Jaipur, India: S.P. Publications. Enhancement in deposition and permeation of 5-fluorouracil through human epidermis assisted by peptide dendrimers. Flexibility of short-strand RNA in aqueous solution as revealed by molecular dynamics simulation: Are A-RNA and A'-RNA distinct conformational structures?